I have been enjoying the book, the Artist’s Rule by Christine Valters Painter. It really touches with the contemplative part of my spirit. I am finding myself approaching all of life with a sacredness and gratitude that was only sometimes there in the past. One thing I am discovering is a stripping away of the subtle legalistic approach to spirituality that I learned from the church we left over a year ago. The stripping away feels so good and I am able to be my true self with applying ridiculous rules to my life in fear of offending God or approaching sin. 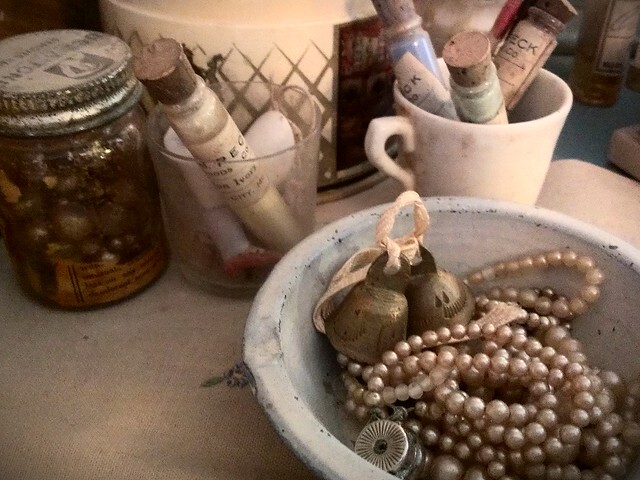 In Week 3 of the Artist’s Rule, the suggestion of an altar space made me identify, dig up and remove another rule. I had the belief that anything labeled altar where we place symbols of our faith or our selves or of God was entering into a form of idol worship. Altars = bad. After some self reflection, I realized that I have always, since a young child, created altar spaces full of symbology. I wish I had photos of the way I would arrange rocks and figures on my dresser as a little girl. I guess I haven’t changed. 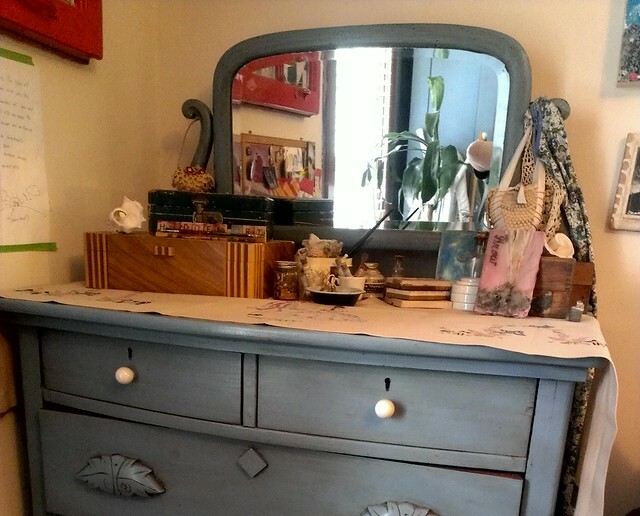 My art supply chest of drawers. Random objects to you, but deeply meaningful objects to me. My childhood treasure box still full of treasures old and some new. 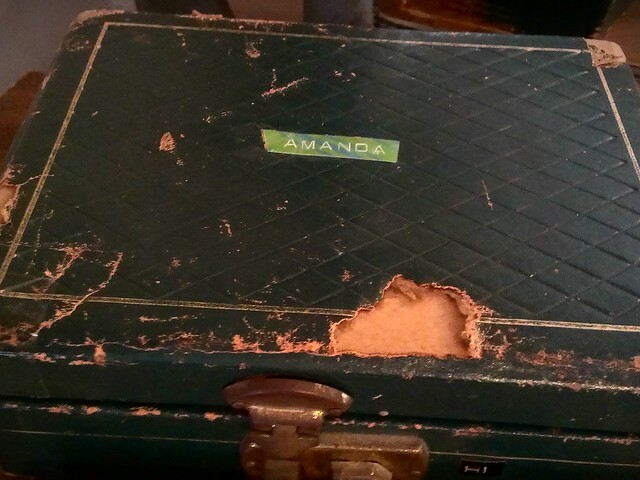 My name stuck to the top in the 70s. This box represents my view of things as sacred when just a child. 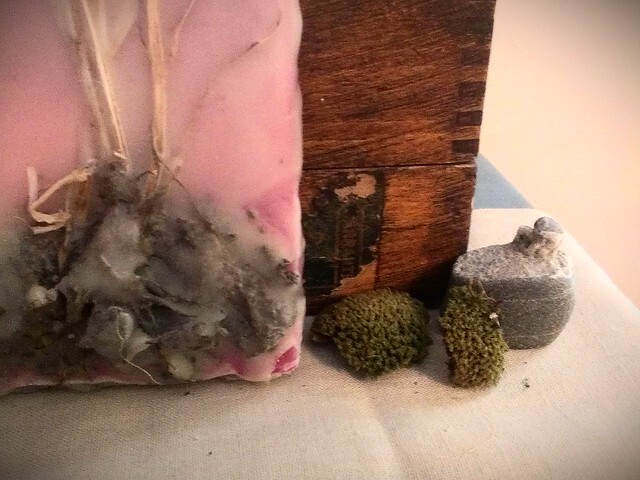 Dirt encased in wax, dried moss, a funky shaped rock, all represent the deep tie my spirit feels to the earth. Pigments from my great-grandmother’s china painting, costume pearls of my grandmother’s that I wore all through college, remind me of the story of my life and the generations before me. The bells in the dish make the most beautiful tinkling and take my mind to the Holy Spirit. This is just one of the many sacred spaces I have created in my home. I can now freely approach any of these sacred spaces with gratefulness and thanksgiving for who God is and who He has created me to be. Liberty feels oh-so-good. Wonderful post, Amanda. 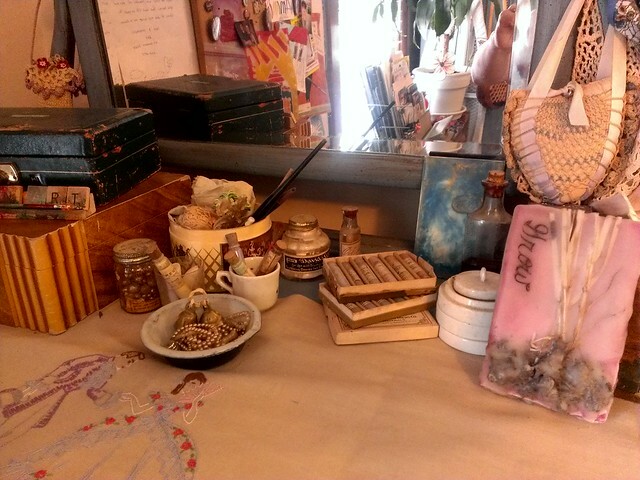 I’m working on re-organizing my studio and will have a sacred space/altar there…also, wish to create a “soaking” space in my walk-in closet for resting in His Presence on the floor. Glad that you are finding new freedom from old ideas…me, too…little by little! that last word is lesson not less! The bells reminding you of the Holy Spirit is joyful. her pearls for years. Thank you, Amanda.